The Royal Mint have announced that after an absence of 47 years from the bullion bar & ingot product field, they will resume production of these items with the exclusive RMR or Royal Mint Refinery brand proudly displayed. The Royal Mint Refinery brand originally dates back to 1852 and was operated for more than 100 years by N.M. Rothschild and Sons. 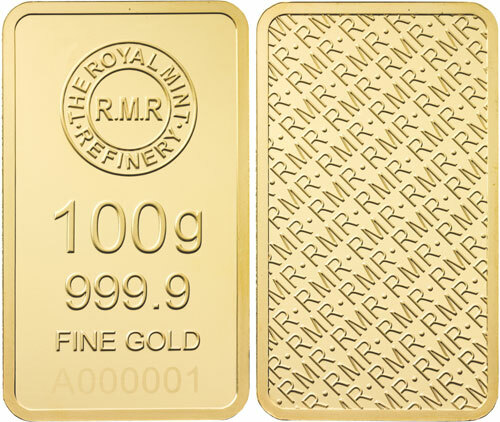 It became an established brand with a strong reputation for handling much of the gold and silver bullion sent to London from across the globe for processing under the RMR label. Royal Mint Refinery became a trustworthy name that survived both World Wars and served as an ever evolving bullion market until production ceased in 1968. The Royal Mint Refinery brand has now been revived by The Royal Mint, an organization with a history stretching back over 1,000 years which today is recognized globally as a secure bullion provider with a reputation for integrity and quality assurance. The Royal Mint Refinery bars, produced in either 9999 fine gold or 999 fine silver, are likely to appeal to customers looking for a cost effective way of buying any amount of bullion; the gold bars have the added attraction of being VAT free to individuals. UK citizens looking to enhance their Self-Invested Personal Pensions or Small Self-Administered Schemes can benefit from up to 45% tax relief on their purchase of gold RMR bars if bought through their pension scheme. The gold bars offered will be produced in weights from 1 gram to 100 grams (five weights in total) and the silver bars will be produced in weights of 100 grams. Minted bars are finished to a bullion finish and presented in serialized security packaging (credit card sized and sealed protective package to transport and preserve your bar securely) with an individually numbered certificate. Each bar & ingot will bear a unique serial number matching the serial number on the authentication certificate provided with each bar, giving buyers the confidence that their bar has been manufactured by a trusted source. 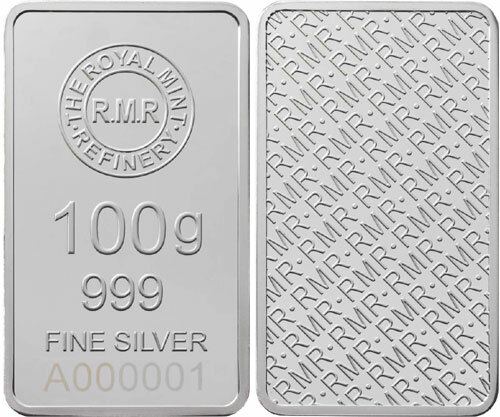 Royal Mint Refinery Bars will be available exclusively through www.royalmintbullion.com, the organization’s online bullion-trading platform which was launched in September 2014, enabling customers to buy, sell and store The Royal Mint’s bullion range online, quickly and securely, 24 hours a day and 365 days a year. Customers have the option of storing 100g gold bars in The Vault™, The Royal Mint’s on-site precious metal storage facility, which is protected at all times by the Ministry of Defence Police. There are no minimum or maximum order quantity restrictions but storage at the Royal Mint’s The Vault facility is only available for the 100g gold bar, for which there is no storage quantity restriction. 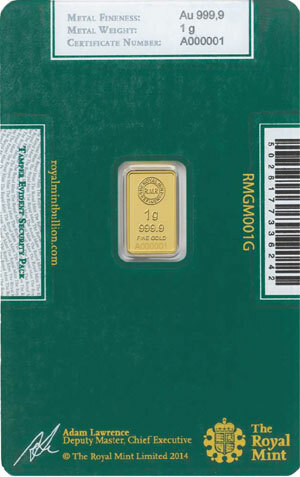 For more information on the new range of bullion bars & ingots, please visit the website of the Royal Mint at: http://www.royalmint.com/bullion Information offered in English. At $1 a gram, that sure is NOT bullion pricing!! That is $31 an ounce! No wonder no one buys from this Mint! Good luck!